If you have ever lived thru an Arkansas summer, then you know all about the heat this building will experience. Heat can do amazing things; warp furniture, melt valuables, and create an uncomfortable environment inside your storage building! With our wood siding, your building is still cooler than a metal sided building would be. 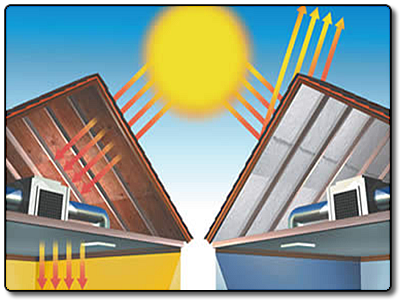 In addition to this, we now offer you the option of having a Radiant Barrier Roof Decking installed called "Thermostat". This special roof decking has an aluminum foil on the bottom side. When the sun's heat rays hit this barrier, it reflects the heat back outside, not allowing the heat to enter your building thereby keeping your building up to 20 F degrees cooler! Below are a few of the benefits of choosing "Thermostat" Radiant Barrier! Roof: $0.75 per floor sq. ft. Walls: $1.50 per floor sq. ft. This is a one-time charge! The savings are yours for a lifetime! Standard Attic with no Radiant Barrier. Notice how the heat comes right thru the roof and into the building! Special Attic with Radiant Barrier installed. Notice how the sun's rays do not penetrate the barrier! This keeps your building much cooler. Request "Thermostat" in your building today!